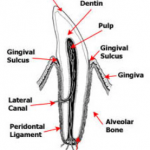 One of the most critical things to know about the anatomy of the tooth is that it’s not permanent. Much like tree rings, the tooth will deposit additional dentine with each year of age. However, unlike a tree, the dentine is deposited internally and results in a smaller pulp cavity and thicker, more solid dentin layer. This is critically important when deciding what to do with older, worn teeth, or teeth that have fractured. When the enamel becomes chipped or worn, bacteria can grow in the microtubules of the dentine, resulting in a discolouration of the dentine. This image shows a dog’s mouth with significant wear on the incisors from chewing. Note the pigmented area at the center of the tooth. In these cases, dental x-rays are used to determine whether there is exposure of the pulp cavity or bacterial invasion of the secondary dentine. 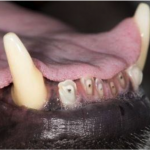 It is possible in some older dogs that enough dentine has been deposited in the apex, that the tooth becomes de-vitalized (dead) and has a small remnant of the pulp cavity remains. In these instances, there is a little indication for removal or repair of the tooth, as there is no discomfort associated with the exposed pulp cavity. Where teeth are broken and not worn, the outcome is often quite different. 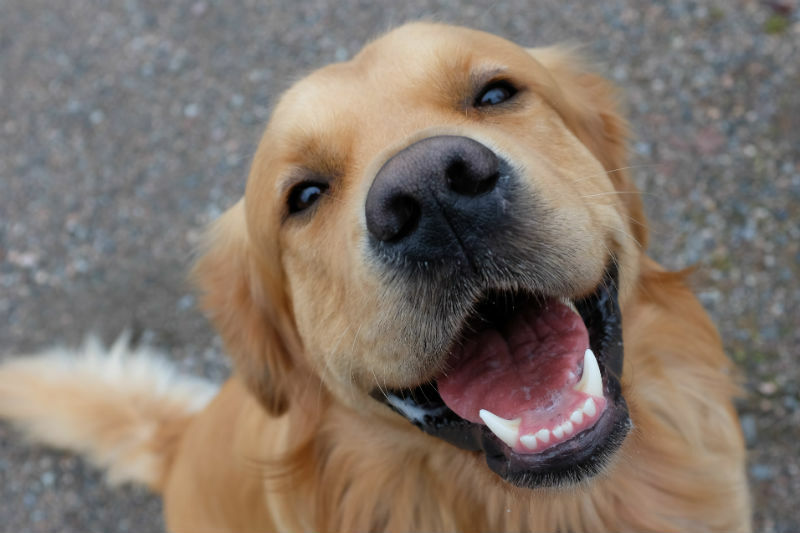 Tooth fractures occur form two main sources: following a traumatic force to the mouth, or fro m the dog chewing on something that was simply stronger than the teeth. When we encounter a fractured tooth, the first thing to do is assess if the fracture has compromised the structure of the tooth and resulted in fragments that need to be removed. This can be difficult at times where fractures of the canine tooth are near the gum. It can be difficult to see if there are fragments that have splintered off under the gum line. In these instances, dental radiographs should always be performed. Another situation where fractures can be difficult is where a slab fracture of a carnassial tooth is still held in position with a flap of gingiva; where a fracture has been identified as the second thing to asses if there is pulp exposure. Where pulp is exposed, the tooth will have a pink or red dot that may bleed upon contact, in situations where an older fracture is identified, a small black crater may be identified. In all cases, the client should be informed that the integrity of the tooth has been compromised and that there should be something done for the patient’s comfort and to prevent further more severe issues (abscesses) in the future. Where the pulp is exposed, the pulp will experience an invasion of oral bacteria resulting in pulpitis. This pulpitis if left unchecked, will travel down the length of the tooth to the apex of the tooth and in time, will result in a tooth root abscess. As in many aspects of veterinary medicine, there are your three options; do nothing, repair and removal. Doing nothing doesn’t require much of an explanation, and nothing further will be said about that. Removal is also something that we are quite familiar with and will not be discussed further. Repair as an option is something that is often overlooked, but much like an orthopedic fracture dental fractures, if caught in time, can be repaired and normal function restored without removal. A procedure known as a partial pulpotomy is best performed in the first 2-3 weeks following a traumatic event. This window is important because, at this time, the pulpitis has not penetrated the pulp cavity more than 5mm. The partial pulpotomy procedure cores out the top 5-7mm of pulp and effectively seals the top of the tooth again, preventing further bacterial penetration. This procedure is commonly done in human dentistry when a tooth has been broken. It’s most frequent application is in teenagers and young adults who have large pulp cavities. In humans, the greatest success is seen when treatments are applied shortly following the injury. In people, a partial pulpotomy can last for many years. Where correctly applied in veterinary application, it will easily last the lifetime of the pet. This procedure is relatively quick and is a great option when the tooth is compromised, while still providing a structural function prohibiting its removal. In addition, this procedure is often comparable to the cost of having the tooth removed. The other option is having a root canal performed. This procedure involves coring out the entire pulp cavity, as well as shaving off some of the dentine from the inner surface of the tooth. The tooth is then backfilled, to provide a solid core and then capped in the same way that the partial pulpotomy would be capped. Again, if done correctly, this procedure can easily last the lifetime of the pet. Choosing a root canal over a partial pulpotomy is often based on a judgement call on the type of fracture, the duration since the trauma, the likelihood of further trauma and the patient’s age. As medicine and expectations continue to advance, having access to more advanced dental options has become a requirement for those providing comprehensive care. 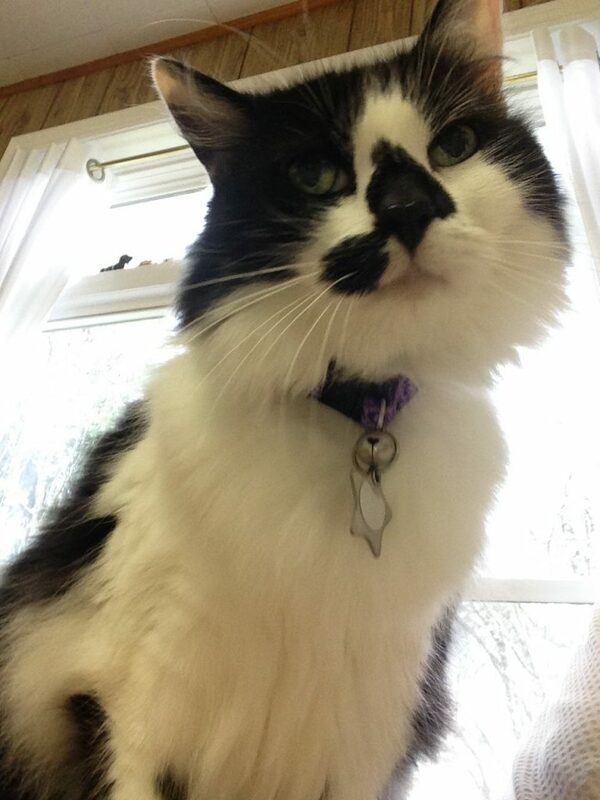 At the Riverview Animal Hospital, we have welcomed Dr. Dwan to join our team. He will be applying his skills in advanced dentistry, which will compliment many of the services that we already provide. Feel free to contact our team if you have any questions.